PORTLAND, OR--(Marketwired - Feb 18, 2015) - Inavero, the world's leading provider of client and job candidate service quality research for staffing agencies, today announced its 6th annual Best of Staffing Award winners and launched the first and only online directory to finding these superior agencies by city and area of expertise in the U.S. and Canada. Presented in partnership with CareerBuilder, the 2015 Best of Staffing® Award winners are being recognized for exceptional service quality based on satisfaction ratings given to them by their clients and job candidates. Inavero's Best of Staffing program provides the only statistically valid and objective service quality benchmark for the staffing industry. The staffing agencies listed on BestofStaffing.com have proven to be the best agencies for companies and job seekers to call when they are in need. The elite Best of Staffing Award was earned by fewer than 2 percent of all staffing agencies in the U.S. and Canada. Winners earned satisfaction scores more than three times higher than the industry average. "With a tightening labor market and a need for growing companies to stay flexible, staffing agencies are placing more people into employment opportunities than at any other point in history," said Inavero's CEO Eric Gregg. "More companies than ever before need a staffing agency with a proven commitment to service excellence. 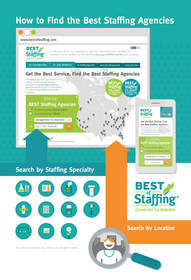 Bestofstaffing.com is the place to find winning agencies that place talent with the skills you need in your city or state. We are incredibly proud of the accomplishment of our 2015 award recipients." Inavero administers more staffing agency client and talent satisfaction surveys than any other firm in the world. Inavero's team reports on over 1.2 million satisfaction surveys from staffing agency clients and talent each year and the company serves as the American Staffing Association's exclusive satisfaction survey partner. Inavero's Best of Staffing® Award is the only award in the U.S. and Canada that recognizes staffing agencies that have proven superior service quality based completely on the ratings given to them by their clients and job candidates. Award winners are showcased by city and area of expertise on BestofStaffing.com -- an online resource for hiring professionals and job seekers to find the best staffing agencies to call when they are in need. A directory of the top staffing agencies that have been awarded for superior service quality, as identified by 690,414 verified reviews and counting.